Savory sausage and herbs paired with sweet caramelized onions in the quiche of our dreams. Turn up the heat on the onions to medium-high. When they start to sizzle a bit, add the stock or juice (whichever you are using), and cook ~3 minutes, stirring, to deglaze the pan and boil off most of the liquid. Remove from the heat and set aside. Season with a pinch of kosher salt. Line the pie crust in a 9-inch pie plate. In the prepared pie crust, layer the sausage, onions, herbs and cheese. Whisk together the eggs, cream, Dijon, salt, and pepper. Slowly pour over the quiche. 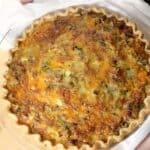 Bake at 400F for 45 minutes or until the top is puffed and very golden (lightly cover quiche with foil mid-way through cooking if the top starts to get too brown, but full cook-time is important to ensure the crust cooks completely). Let the quiche sit for 5-10 minutes before cutting. Yield: 8 servings.